We got so excited about Marina Square's latest renovation as there is a Singapore first integrated Japanese Emporium featuring aged beef facility, live seafood, Japanese Grocer and multiple Japanese restaurants. 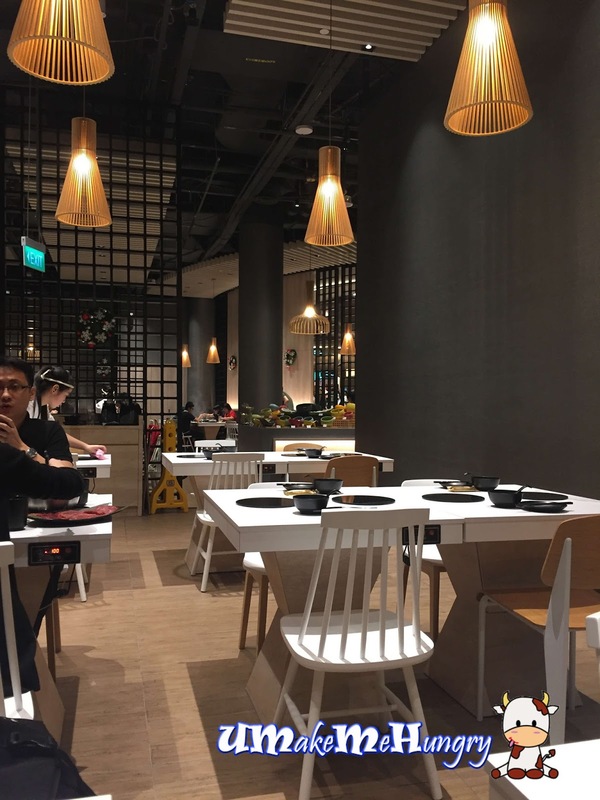 Dining Concept is modernly furnished with wooden hanging lamps and despite having flooring, cupboards, tables and chairs in wood, it does give a classy Japanese touch in the atmosphere. 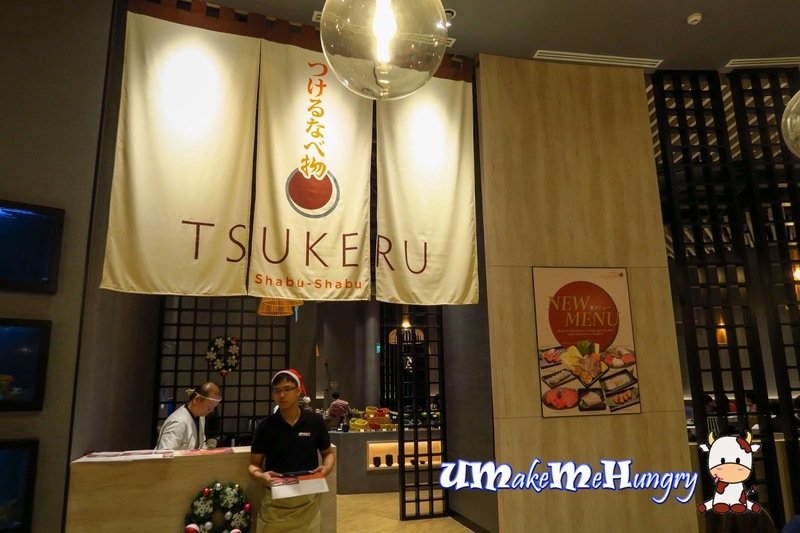 No worries if you are dining at Tsukeru for the first time as their friendly staffs are always ready to assist you. 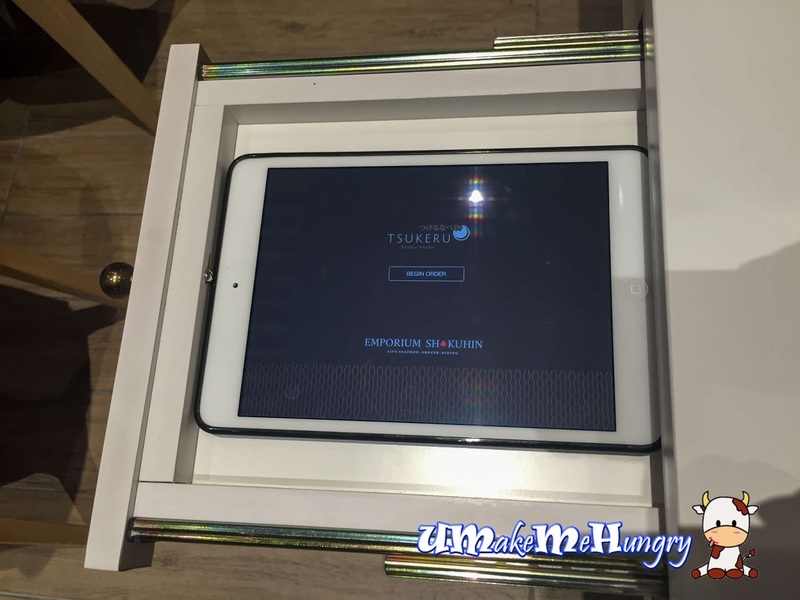 There is a side drawer at every table that contains the electronic menu as well as ordering system in an Ipad Mini. 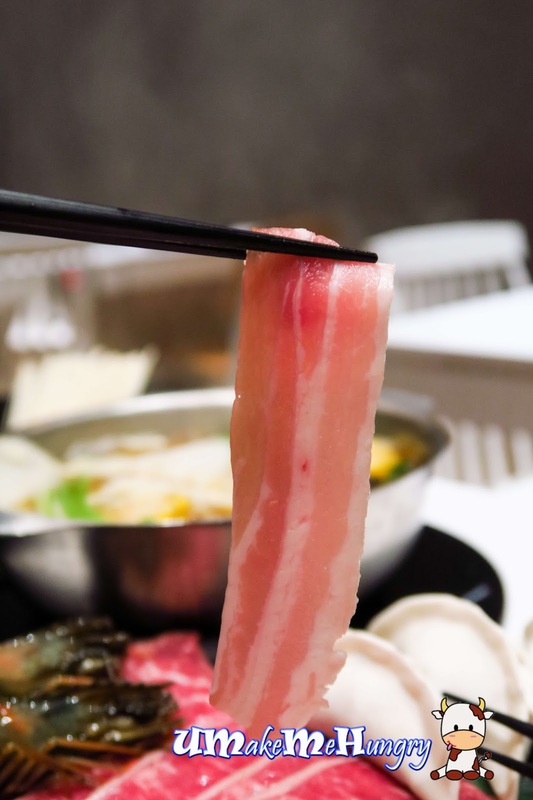 We got our orders through the staff on service and it was all sent to the kitchen without hassle. Since Tsukeru specialised in serving Shabu Shabu, it would be best to grab their specially concocted sauce here for additional taste! 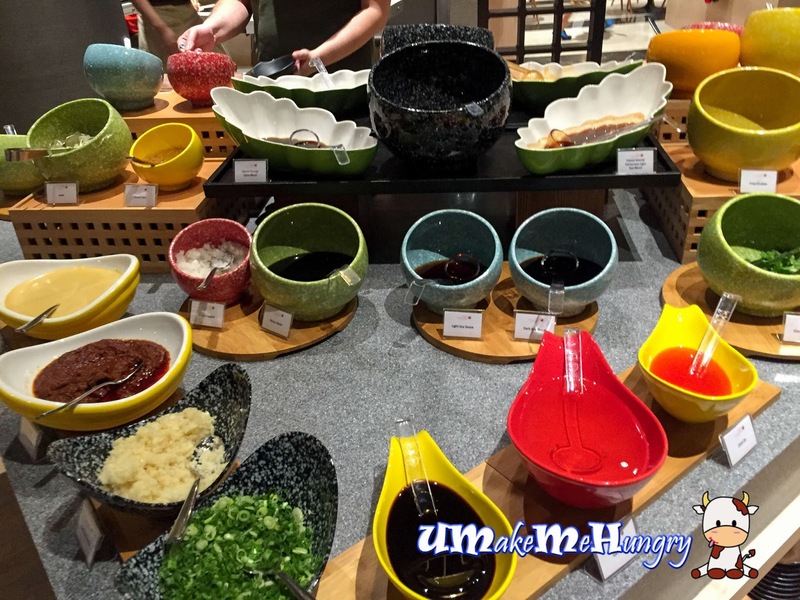 Range of sauce is pretty interesting which also includes our local sambal chilli sauce despite its a Japanese Restaurant. 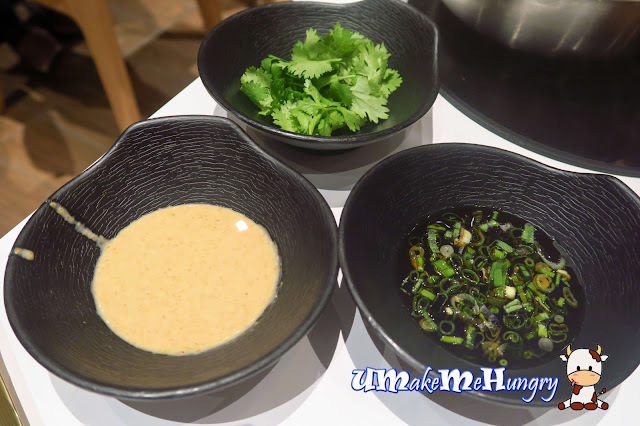 You can also find mustard, ponzhu sauce, spring onions, corriander leaves etc. 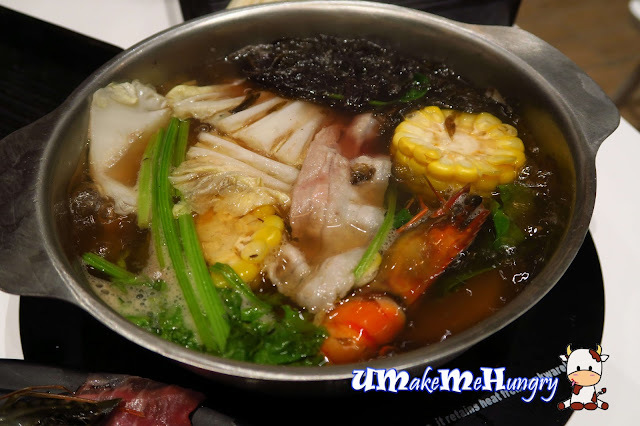 Hotpots are individual and you get to choose your broth base from Asian and Japanese Cuisine such as Tom Yum, Ginseng Chicken, Tomato for example. I have been missing konbu seaweed for sometime and since it was Tsukeru's recommended broth, I looked no further and decided the base. Thankfully, the pot of broth was not just only filled with liquid. Big pieces of Konbu were given and I was relieved as it was since a good long time I had them! 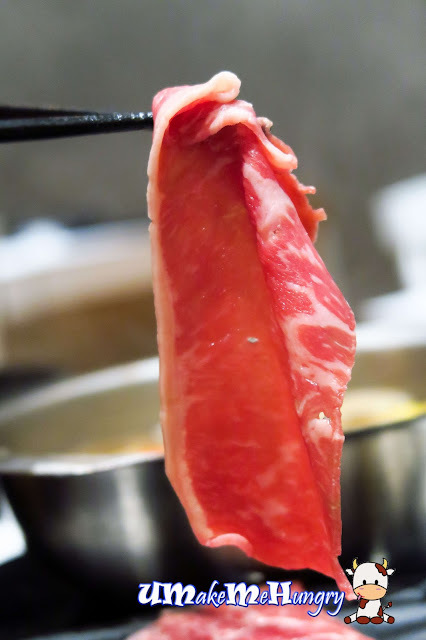 We decided to ditch the usual Asian Broth we normally get in the hawkers and decided on Tonkotsu Miso Soup. 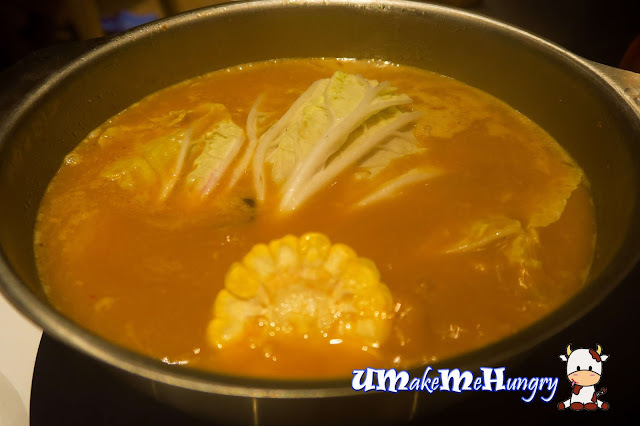 At the first round of the soup, it was on a salty side till the servers came around topping up the soup promptly and eventually the taste of broth get bland. While the man could not do without a bowl of steam rice at $3 for his dinner, I got my carbo fixed with their Inaniwa Udon. 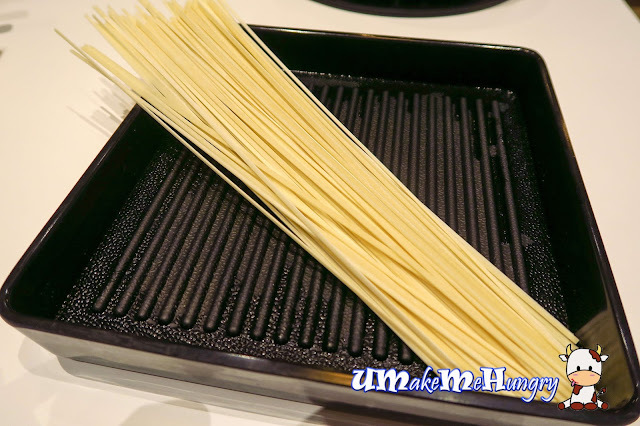 These cream colored Udon are dried and thinner than the usual Udons we had. 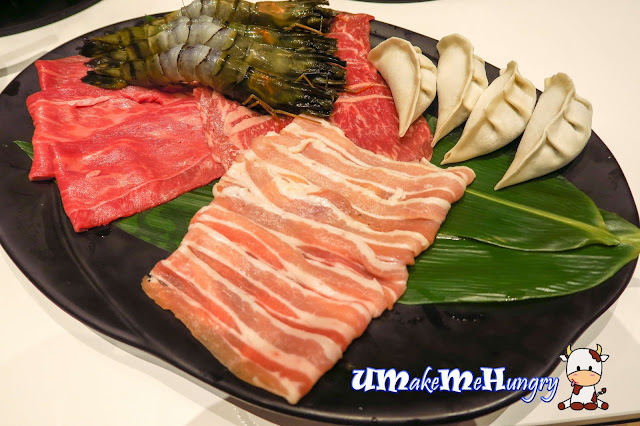 We had the platter of 2 consisting of prawns, dumplings and 3 kinds of prime meat, including Wagyu beef and Kurobuta. 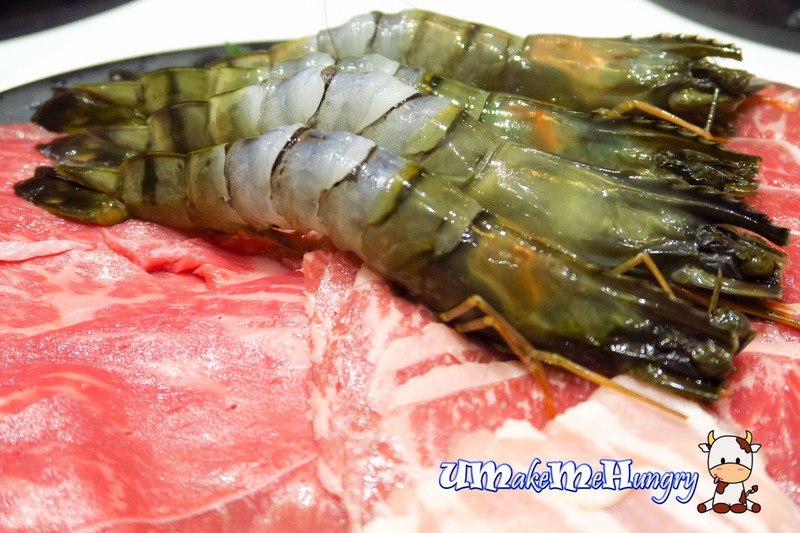 Prawns were fresh and in an acceptable size. Shells in its mid body had been removed. 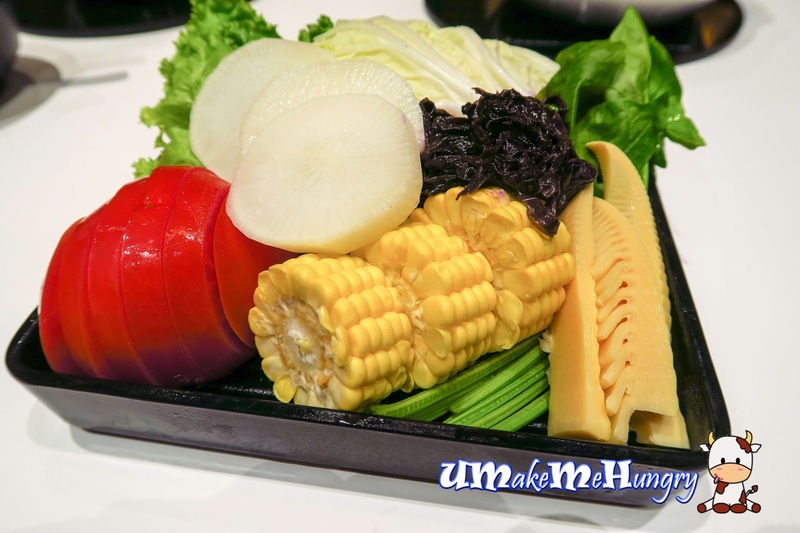 Balancing out the meat intake, we had ourselves the healthier choice - Vegetable Platter at $15 which consist of tomatos, radish, seaweed, cabbages, lettuce and bamboo shoots. 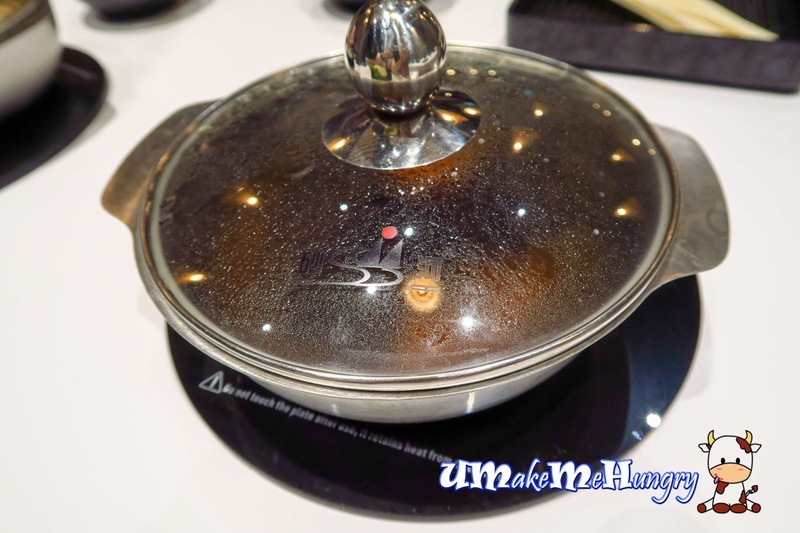 With induction cooking, my pot boiled in a while. 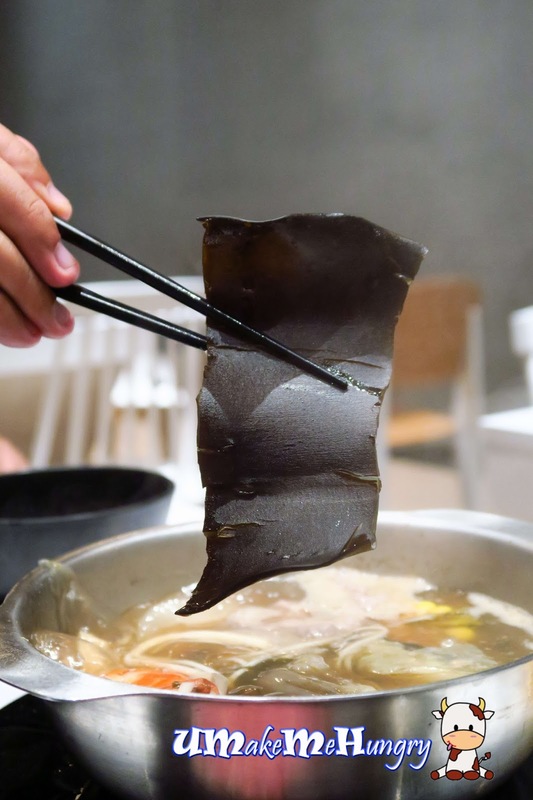 I particularly like their seaweed from the vegetable platter but do note that it will change your soup into purple color. Condiments to pair up with my Shabu Shabu meal. 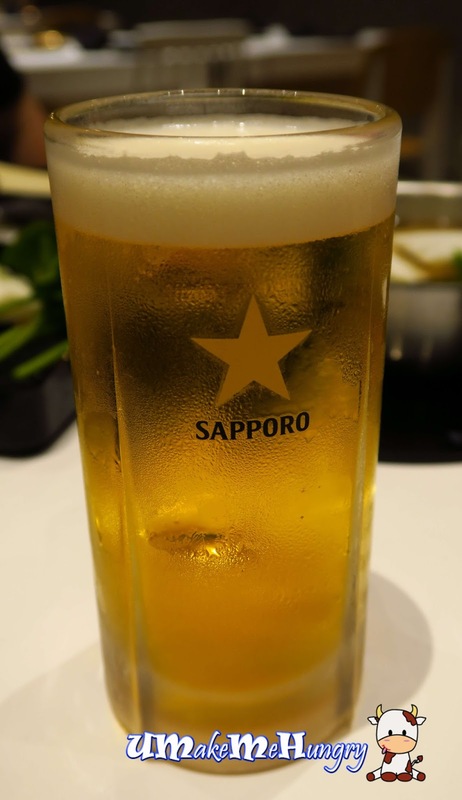 Since their Sapporo draft beer is 1 for 1, we have ourselves a cup each washing down the dinner. Total bill for 2 is $134.88 after GST and Service Charge. 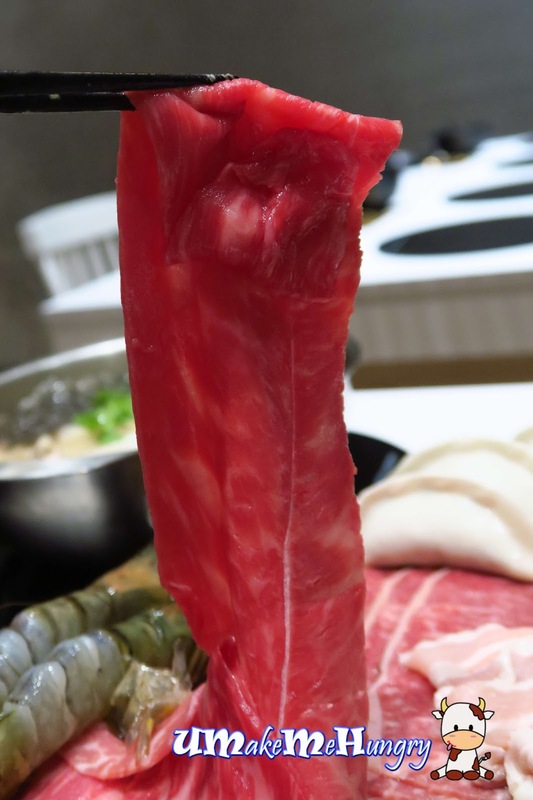 It was a good experience enjoying Shabu Shabu with premium meat and a good range of self selected sauce.